In 12-inch skillet or Dutch oven, heat oil over medium-high heat. Add beef; cook 4 to 6 minutes, stirring frequently, until browned on all sides. Spray 4- to 5-quart slow cooker with cooking spray. In cooker, mix browned beef and remaining ingredients. Choose the right beef for stew—you may be able to buy already cut up stew meat in the meat department or buy a chuck roast, that has a good ratio of fat and collagen marbled through the meat. Chuck will hold up to the long, moist braising, only getting more tender, and is inexpensive. Don’t skip the step to really brown the chunks of beef before spooning them into the slow cooker. The browning adds a wonderful depth of flavor and appealing color to the meat; the high heat used to sear also caramelizes the surface of the meat and is worth the extra time. Add a handful of chopped parsley or grated lemon peel to finish your dish, both are fresh matches to the deep richness of the stew. To store this stew for later, refrigerate in a shallow container so it cools rapidly. Once completely cooled, cover tightly and refrigerate for up to 3 days. To freeze this stew, pour into freezer containers, leaving 1/4 to 1/2 inch head space (because soups expand as they freeze) and store for up to 6 months. Because tapioca is one of the few thickeners that does not break down during long, slow cooking, it can be added at the beginning of the cooking time. Thickeners such as flour and cornstarch are best added at the end of the cooking time. The story of the slow cooker’s invention as warming as a hearty bowl of stew on a cold winter’s day. In 1940, inventor Irving Nachumsohn received a patent for a device that was inspired by his mother’s stories of making an overnight dish, cholent, back in her home village in Lithuania. After he sold his design to Rival Manufacturing in 1971, the Crock Pot, with the promise that it “cooks all day while the cook’s away,” hit the market. 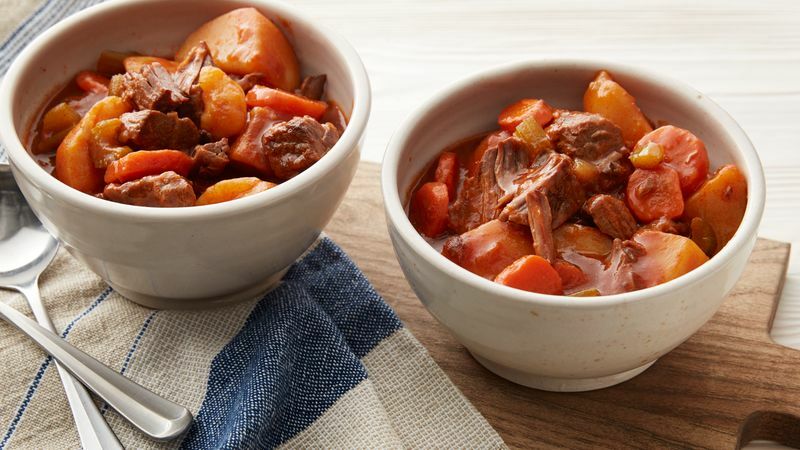 These days, dishes like slow cooker beef stew are as popular as ever, and no wonder – estimates say that about 83 percent of families in the United States own a slow cooker. If you’re inspired by this crock pot beef stew, try one of our many other beef stew recipes. You’ll find ideas for time-tested favorites and updated new twists for your slow cooker and instant pot.